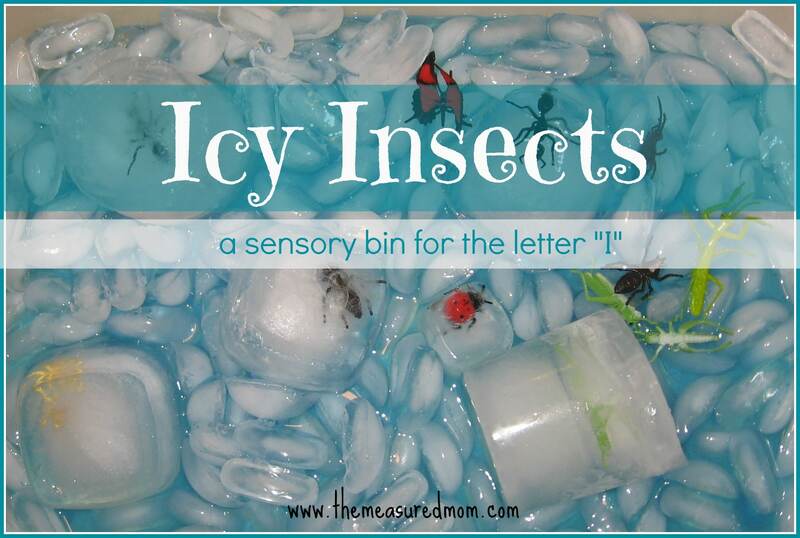 Insect Sensory Bin for the Letter I – Icy Insects! We’re moving through the alphabet and have done a sensory activity for each letter. What to do for the letter I? 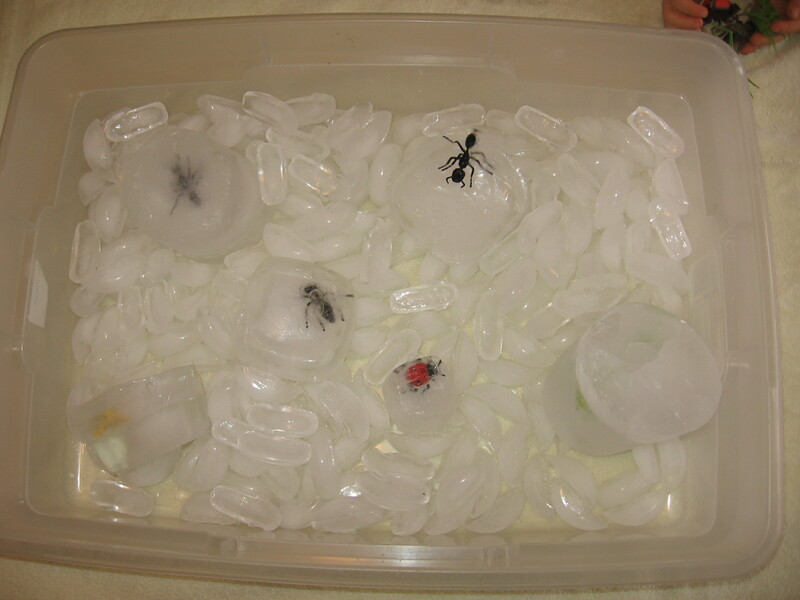 I decided we’d make an insect sensory bin – and throw in some ice to make it even more interesting! The day before, I froze some containers that were filled halfway with water. A few hours later I added a plastic bug and more water to each container. 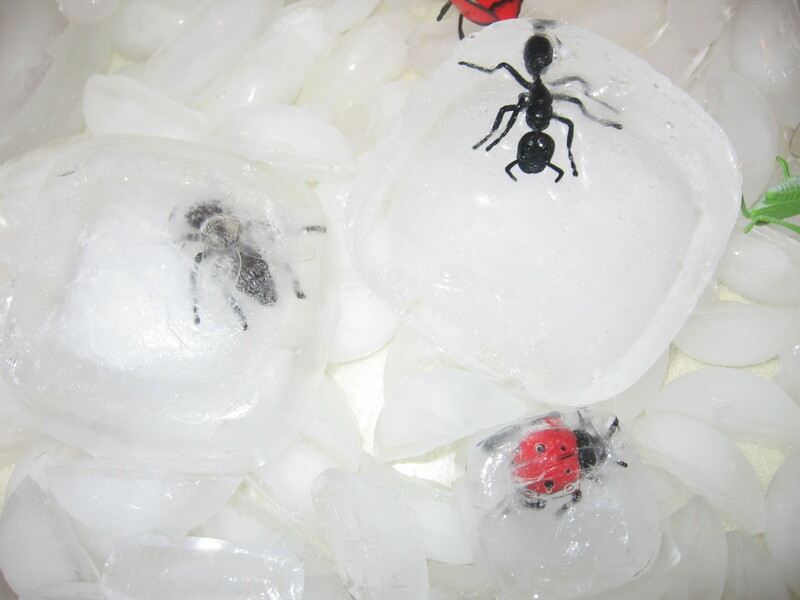 Today we had icebergs with bugs frozen inside! These bugs were from the Safari Ltd Insects Toob. 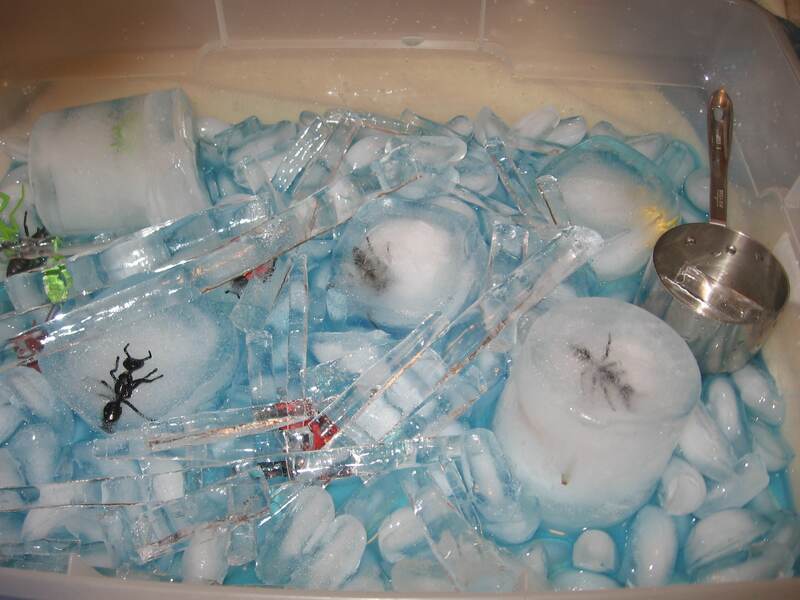 I left out the spider and other bugs that are not insects :P.
First I dumped all the ice from our freezer into a big plastic bin. 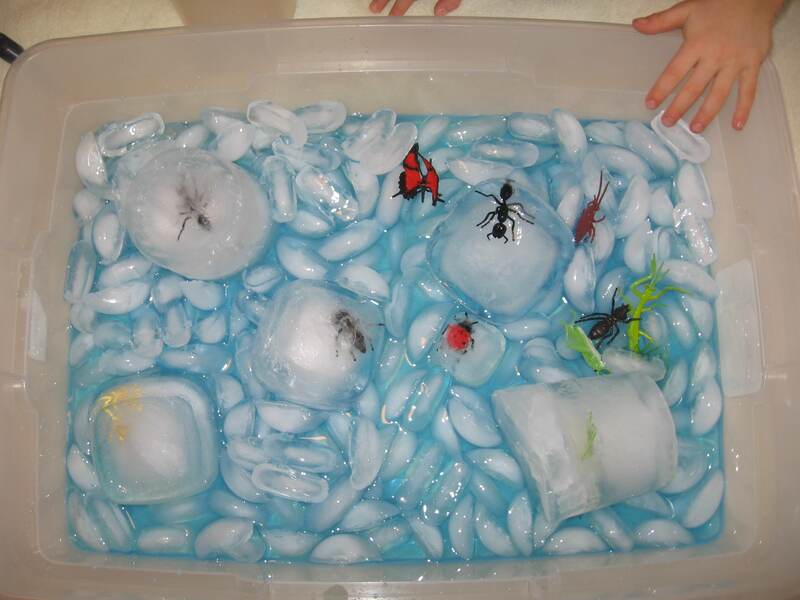 Then we added our insect icebergs. Next, my Four helped me stir blue food coloring into a pitcher of water, and we added it to the bin. And since spring shows no sign of being on its way, we threw in a bunch of icicles from the front of our house. The water in the bin felt a little — well, icy. 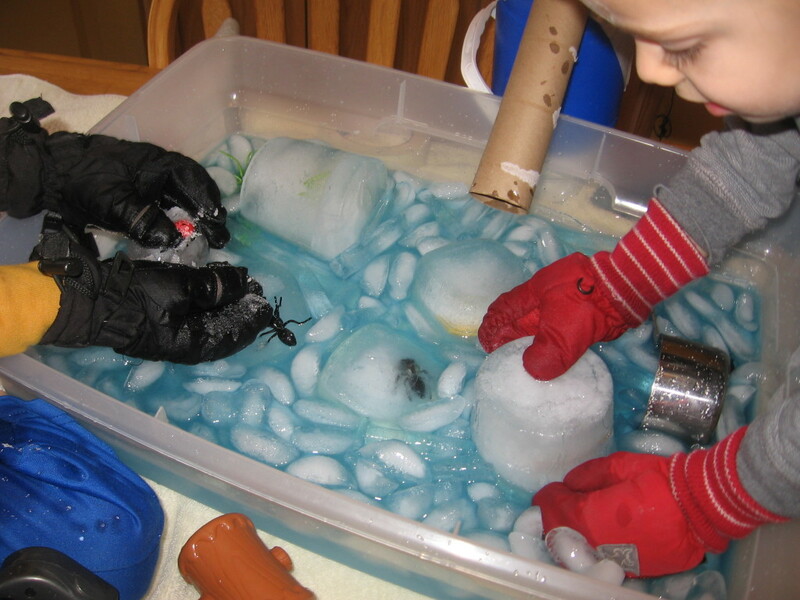 So the boys put on their mittens while they tried to figure out how to get the bugs out of the icebergs. 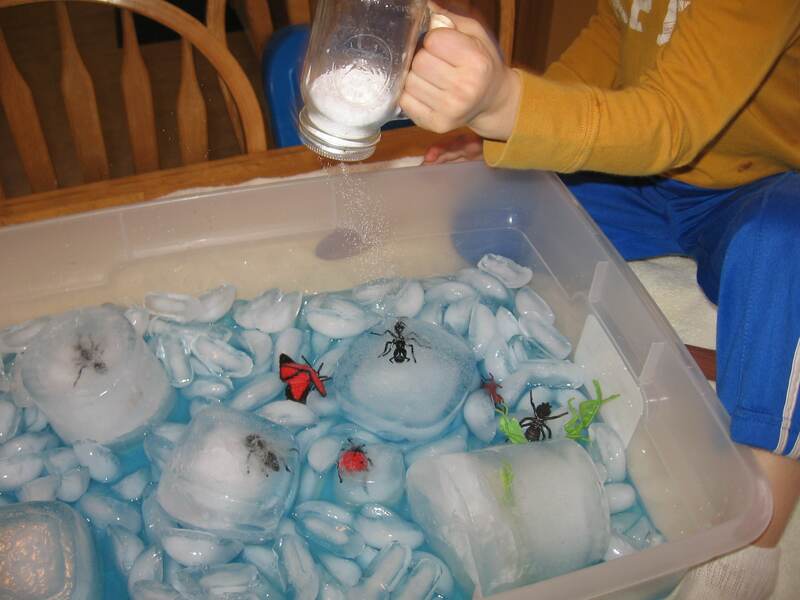 We sprinkled salt on the icebergs and noticed how that helped them melt more quickly. Pouring warm water on the icebergs melted them pretty fast. The boys were anxious to de-ice all the bugs, so I drained the bin’s cold water and added warm. Things went quickly after that! Finally, they fished out the bugs using a hand-held sieve. Ew, a cockroach! Throw it back! 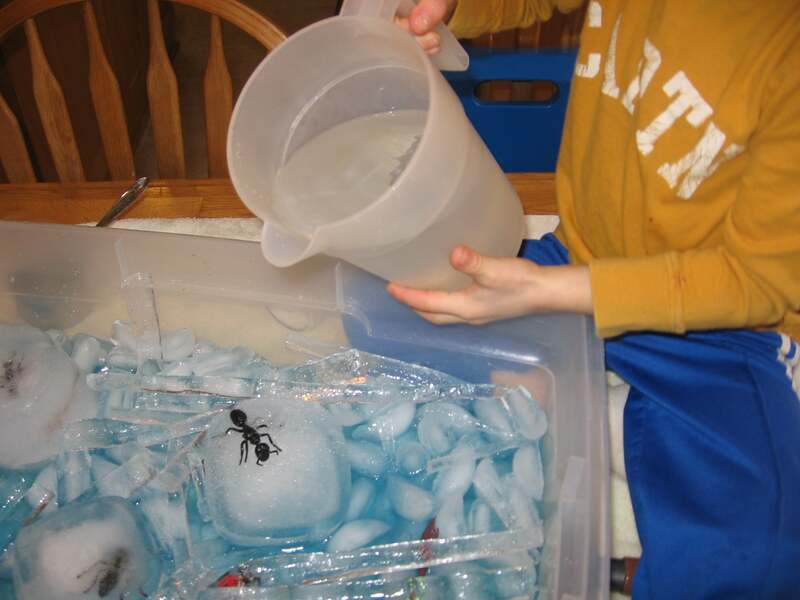 Our Icy Insects Sensory Bin was inspired by this post from GummyLump: Ice Sensory Bin – Winter Creative Play. Looking for more sensory bin ideas? Follow me on Pinterest! Follow The Measured Mom’s board Sensory Bins on Pinterest. © 2013 – 2018, Anna G. All rights reserved. Hi Anna! I was just popping over to see what you’ve been up to. 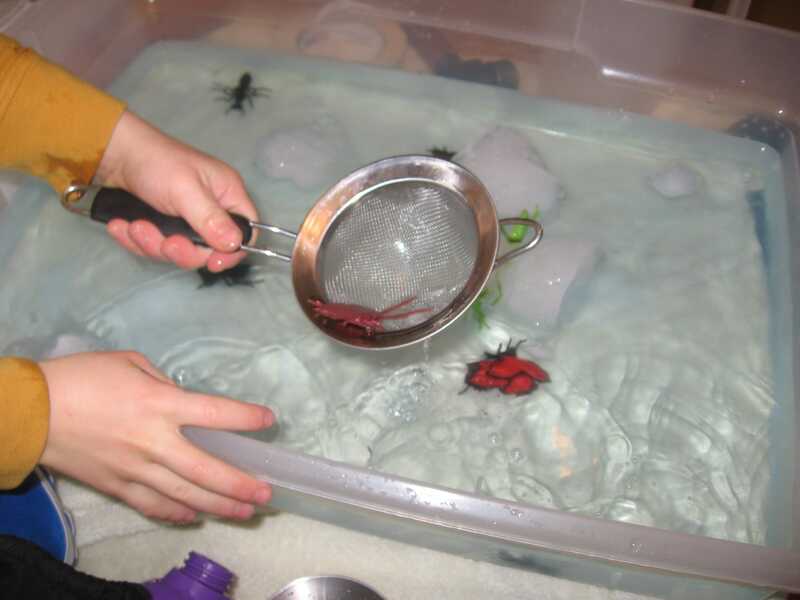 I looooove this sensory bin, and I think I’m going to pin it to my insect board on pinterest. How fun! Thanks for sharing, and I hope you’re having a good week. Thanks so much for stopping by, Mary Catherine! I hope you get a chance to try this with your class. I haven’t used sensory bins with my two girls. It looks like fun! They must be worth the mess… I’ll have to do some research. That looks like sooo much fun! Thanks for sharing at Share it Saturday!